The blood thinner Pradaxa, (subject of 6 wrongful death US lawsuits), according to a new FDA report, may have been responsible for another 117 deaths during the second quarter of 2011. The Institute for Safe Medication Practices (ISMP) published their quarterly report (PDF) earlier this week on adverse event reports between April and June 2011. Pradaxa (dabigatran) is associated with more adverse reported cases than any other regularly monitored drug, the anticoagulant had been on the market for less than a year at the time. Pradaxa was associated with 856 reports of serious, disabling or fatal injury in the second quarter of 2011, including 117 patient deaths on Pradaxa and 511 cases of Pradaxa bleeding events. Most of the reported hemorrhages involved patients over 80 years old. 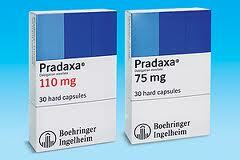 Pradaxa (dabigatran) was released by Boehringer Ingelheim in the United States in October 2010, as a superior alternative to Coumadin (warfarin) for prevention of strokes among individuals with atrial fibrillation. It is the first approved anticoagulant from in a new class of medications, known as “direct thrombin inhibitors,” which blocks the enzyme pathway that causes blood to clot. The United States Food and Drug Administration has issued a safety announcement about the anticoagulant drug dabigatran, marketed as Pradaxa®. This information is based on the FDA’s review of post-marketing reports of serious, and even fatal, bleeding events in patients taking Pradaxa®. The possible increased risk of serious bleeding events with Pradaxa® is confirmed by epidemiologic studies. A recent study also found an increased risk of heart attack or acute coronary syndrome with Pradaxa® as compared to other treatments. These medications are promoted as superior alternatives to Coumadin/warfarin because they require less monitoring. Users of warfarin who suffer internal bleeding can be treated with Vitamin K injections, blood and fresh frozen plasma infusions to reverse the blood thinning effects. Unfortunately, Pradaxa and the other newer blood thinners in the same class do not have an antidote and bleeding side effects can only be treated by dialysis. Concerns over deaths linked to Pradaxa has caused alarm and safety investigations in the U.S., Europe and Canada. An increasing number of people throughout the United States are also now pursuing a Pradaxa lawsuit, alleging that the drug maker failed to adequately research the medication or warn about the serious and potentially life-threatening side effects.